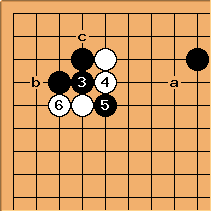 This technique employed by White to avoid the standard shape (White at a) goes back at least to the time of Dosaku. Black has a choice of ways to cut. 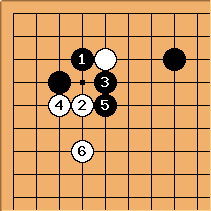 Clearly here Black's cut at a will be met by White b and then there is an important ladder. 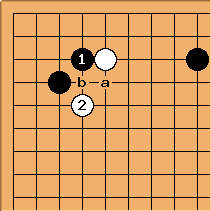 After Black and White seems to have problems, but her resources are White a to escape, and the hane plays b or c to attack Black's current shortage of liberties caused by the empty triangle. This occurred in a game Dong Yan-Lin Feng 2002-05-13 in China. White at is a quieter way to play here. This is from Hashimoto Utaro-Fujisawa Kuranosuke 1955-03-24. With a bad ladder, White opts to play and as a dodging tactic. You could classify this as simple light play, perhaps. Black at is equally popular in this tenuki pincer joseki.